The future of Hazard, who only returned to training with his club a week ago after helping Belgium finish third at the World Cup, may not be sorted out until August 31. 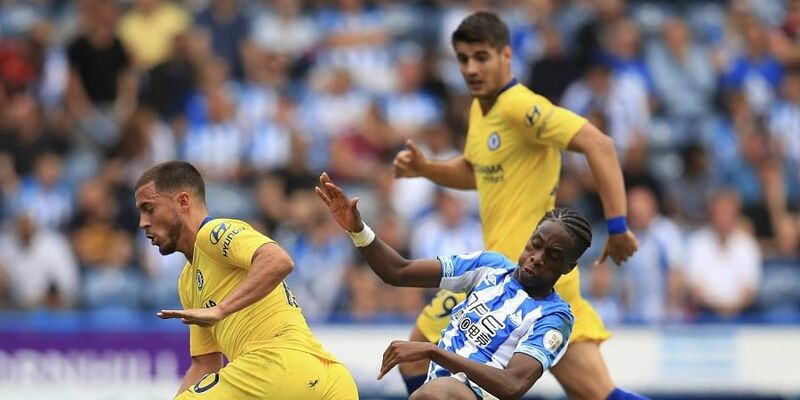 HUDDERSFIELD: Maurizio Sarri admitted Eden Hazard needs more time to get back to his very best despite an impressive 15-minute cameo as a substitute in Chelsea's 3-0 win at Huddersfield. Sarri's side overcame an awkward start at the John Smith's Stadium on Saturday to give their new boss a victory on his Premier League debut at the end of a turbulent summer. N'Golo Kante opened the scoring with a deflected volley, 27 days after starting for France in their World Cup final victory over Croatia, before Jorginho's penalty and a late third goal from Pedro completed a comfortable enough victory. The appearance of Hazard came amid continuing uncertainty over the Belgian star's future. Hazard has been linked with a move to Real Madrid, who signed Chelsea goalkeeper Thibaut Courtois just two days before Sarri's opening Premier League match -- a transfer that added to the sense of instability at Stamford Bridge following Sarri's arrival to replace the sacked Antonio Conte last month. The future of Hazard, who only returned to training with his club a week ago after helping Belgium finish third at the World Cup, may not be sorted out until August 31, when the transfer window closes in Spain. His quality was there for all to see during his brief appearance, with a fine run from midfield taking out several Huddersfield players before he slotted in Pedro to score Chelsea's third goal. Asked if he was surprised by the effectiveness of Hazard's contribution, Sarri said: "I think that Eden in this moment cannot play for 90 minutes. He has to improve, to have training. "I think the best thing is for him to play 15-20 minutes when the opponents probably are tired." While Sarri guarded against giving Hazard praise, Huddersfield head coach David Wagner was rather more effusive. "He is good isn't he?" laughed Wagner. "But everybody fights with their weapons." Sarri has had little time to put his plans into action, having only been in the job for four weeks, and his 4-3-3 set-up did not always look assured against Huddersfield. Steve Mounie headed Aaron Mooy's corner against the post in the first half with the score at 1-0. "It was really hard for us because we played all the matches of pre-season in 4-2-3-1, only one match in 4-3-3," Sarri added. "We have never played against the 3-5-1-1 system that Huddersfield used so we were not ready." Sarri has pledged to play attacking football at Chelsea, and his side did look composed in possession, although he has made clear that he will not look to simply copy the methods he used at his previous club Napoli. "I have to know the characteristics of the players," he said. "I don't want to do another Naples. I want to do a good Chelsea. I have to adapt myself to the characteristics of the championship and the players. Now I study my players." Wagner guided Huddersfield to safety last season, even though they only scored 28 goals. He knows he faces another huge challenge to maintain their Premier League status, but can be glad that he will not have to face players of Hazard's quality every week. "They have their weapons like Eden Hazard, we have our weapons like passion, desire, togetherness, commitment," Wagner said. "Sometimes mentality can beat quality; today their quality was too big even if the mentality of my guys was there. "That's why I'm confident enough to know we have a chance to be successful this season."